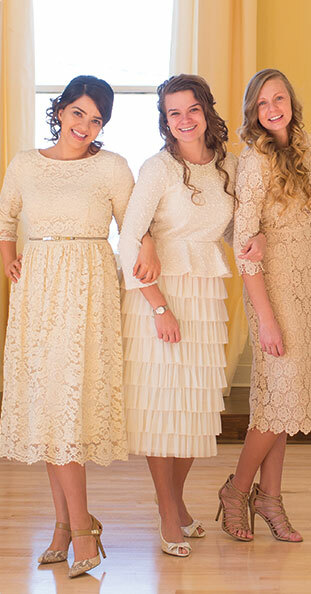 -- Please Choose an Option --	Knee Length 42"-44" Maxi Length 53"-55"
This feminine, vintage dress has luxurious, silky beige fabric that is embellished with rows of exquisite lace at the collar, bodice, and sleeves. The elegant and modest pleated waistline is finished with a dramatic belt that beautifully defines the waistline. This dress is lovely for special occasions, weddings, and holiday events! Back zipper. ALL SALES FINAL. By far my most favorite purchase from Dainty Jewells! Absolutely beautiful!